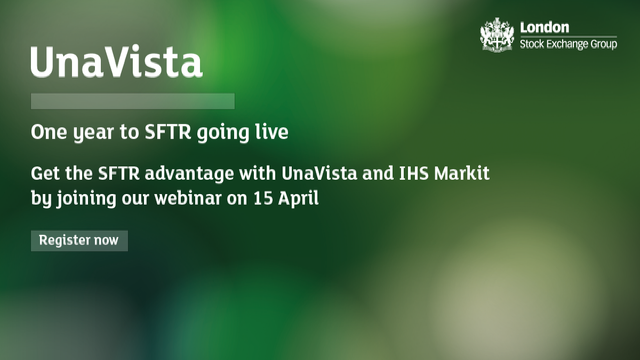 With a proven track-record of providing regulatory reporting solutions in the financial services industry, UnaVista and IHS Markit have teamed-up to help firms prepare more thoroughly for their SFTR reporting obligations. The SFTR Breakfast Briefing was organised to help reporting firms understand key issues affecting firms with a reporting obligation. Upon registration, we asked our attendees what they would like to find out from the event. These key topics formed basis of our panel discussion by our expert panellists. Welcome note by moderator, Andrew Dyson. Watch the introduction, overview of the event and regulatory update. The audience were asked several polling questions including their state of readiness and what module of reporting they were planning to use. - Key focus for reporting firms over the next 12 months. The concluding part of the SFTR Breakfast Briefing features more questions from our audience. Watch to find out if the questions resonate with your firm and if the responses by the panellists can provide you with better clarity on current challenges facing your firm. Presented by UnaVista and Grant Thornton. Join us at this webinar to learn the key challenges of SFTR, lessons learned from MiFID II and EMIR and how your firm can start preparing whilst we await the final draft RTS from the European Commission. This webinar will give viewers the chance to ask the hard unanswered questions on MiFID II reporting to a panel of experts. The webinar agenda will be created by the viewers, send your questions in before the event and we will build the conversation around them. You will also get a chance to ask questions live to the panelists and participate in a series of polls with your peers to benchmark your preparations against the rest of the industry. Register now for this series of webinars to help educate firms on the different aspects of MiFIR reporting before the January 2018 go-live. London Stock Exchange Group and guest speakers will be providing clarity on how MiFIR will affect different industry segments across the most important parts of the regulation. Firms can turn MiFIR into an opportunity to improve their business, register to find out more. All sessions will include a live Q&A with the speakers and a chance to get all your questions answered. During our recent "MiFIR: Beyond the Reporting" webinar, we highlighted some of the ancillary parts of MiFID II that firms are looking into in order to stay ahead of the regulatory reporting curve. Some of the ancillary reporting obligations have not been talked about much by the industry resulting in firms not knowing enough about how they will be affected by these regulations. Join UnaVista at this webinar on Wednesday, 1 March as we shine the light on MiFID II Commodities Positions Reporting. MiFIR goes live in just over 365 days, leading firms are now moving past trade and transaction reporting and focusing on remaining requirements. UnaVista and TRADEcho invite you to this webinar where we will be talking about the ancillary parts of MIFIR reporting. How will your firm address RTS 23 Reference Data Reporting? Are you required to do Commodities Position Reporting? How are you going to acquire LEIs and ISINs for your reporting? Find out more on this webinar. How do you develop a regulatory reporting and data reconciliation strategy that allows your firm to not only comply but become more efficient? In the wake of the financial crisis, global regulators have created a conundrum of overlapping regulations with challenging data demands to be delivered in multiple formats. In order to comply with these regulations in time for the tight deadlines, firms often rely on separate tactical solutions, leading to further operational and technical challenges down the line. Firms also have the additional task of integrating data integrity controls to confirm the accuracy information throughout their data workflow. In this webcast, experts discuss strategies for incorporating optimal regulatory reporting and reconciliation processes. How to create operational efficiency across multiple global reporting regimes. UnaVista is hosting this webinar to help firms with their preparations for MiFIR reporting. On 10 October ESMA released the final guidelines on MiFIR transaction reporting, we will provide a summary of the changes and details of how your firm can make the most of MiFIR reporting by illuminating best practices. We will also demonstrate UnaVista’s MiFIR service, which is now available for clients to test in , and showcase a few services that will help your business not just comply but thrive because of MiFIR. UnaVista and SIX Group have formed a partnership to help make reporting for this regime as simple as possible. Using your connection to UnaVista, you can route trades to SIX’s derivative trade repository allowing you to have one view of all your regulatory reporting. Join us at this webinar to hear from our UnaVista and SIX experts on how the regulation affects you and get an overview of the solution for Swiss reporting. EMIR trade reporting is going to go through some fundamental changes in the beginning of 2017. ESMA are introducing a large addition of new fields, changes to position reporting, collateral reporting and asset class specific fields. These EMIR trade reporting changes are far more complex and onerous than the Level 1 and Level 2 validation changes – if you are not already planning for these changes, you need to start now. In this webinar we will help get you up to speed about what to expect and how to prepare. Firms are changing the way that they perform reconciliations. The large amounts of regulation affecting firms has placed data integrity high up the priority list. Reconciling across systems internally and externally, whilst having access to the correct reference data sources is an issue. In this webinar CEB TowerGroup will present their new research into financial services and why firms are looking differently about how they reconcile their regulatory data. UnaVista will provide a regulators perspective on what they look for in reported data, and some insight into how technology can help firms put the correct systems and controls in place. There will then be case study from a large buy-side firm on how they address their data integrity for regulations.